Armstrong Alar Chain Corporation supplies a wide selection of jack chain kits for hanging light fixtures, decorative purposes, single jack chains, double jack chains, for industry and OEM applications. 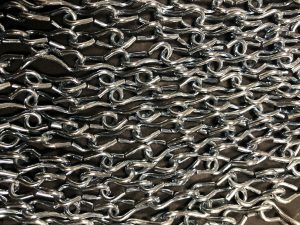 With every type of weldless chain defined by the NACM, Armstrong Alar Chain Corporation supplies several companies with the highest quality jack chain kits available. We supply the largest quantity of wire gauge and lengths amongst other companies. Armstrong Alar Chain Corporation manufactures and distributes 35 separate sizes of jack chain kits so that you can get the perfect chain kit for your exact application. Our jack chain kits are manufactured to be tough, corrosion free, and reliable. All sizes are available in several finishes for weather resistant/outdoor use, our jack chain kits are the best option available. At Armstrong Alar Chain Corporation, bulk chains and chain related accessories are our expertise. We will help you find the chain you need for your own personal situation. If you would like to place an order with us, please fill out the form to the right and we will contact you shortly or call us at 800-927-8549. Jack Chain kits from Armstrong Alar are available now for purchase and we can accommodate almost any size order and have it delivered anywhere in the U.S.